I love the library! Browsing leads to bizarre finds that often make me think about photography, what I choose to see around me and include, or not, in my photographs. Not a book I would have directly searched for, I came upon ‘The Global Pigeon’ by Colin Jerolmack, and gave it a go. Set mainly in New York with visits to London, Venice, Berlin and Sun City, South Africa, this book covers birds, social relations, manliness, race relations, tradition, gentrification, and the relationship between nature and humans for starters. Totally absorbing. 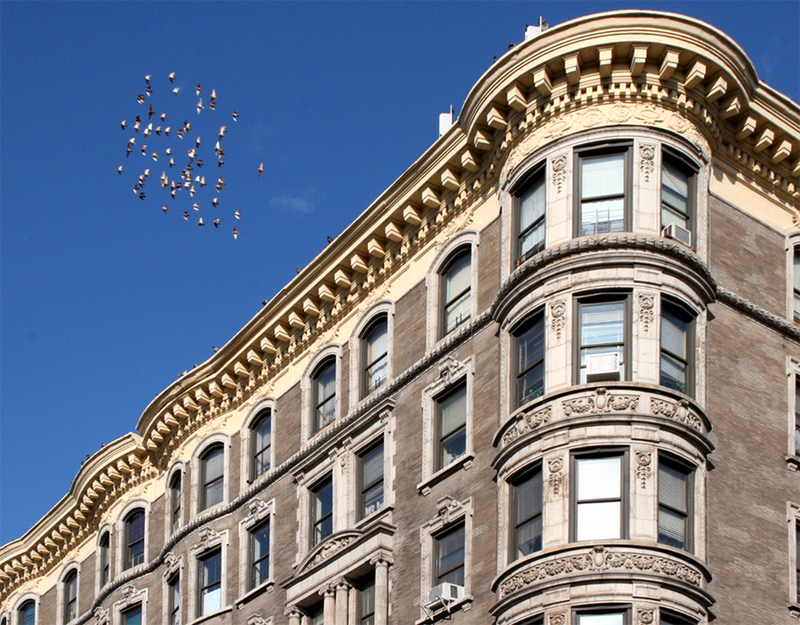 Pigeons are plentiful in New York but they are not the only non-human species we live alongside. On any given day New Yorkers also encounter quantities of bugs, rats, mice, seagulls, hawks and raccoons and of course I am not counting all the domesticated creatures we share sidewalks and homes with, dogs and cats, horses, reptiles, guinea pigs, squirrels and even camels on 3 Kings Day. When I am busy photographing the built environment of New York, I sometimes include the people and occasionally even the weather of New York but never the animals. Is it that the animals are not authentic nature, they are too urbanized to be considered wild yet are not considered an urban product, rather interlopers? Maybe I think that animals do not belong in a representation of cityscape, after all, most of the time I do not represent people in my built environment images so why would I want an animal in there. Animals are there but not always seen, and unless you live with one contact is often a soft step, a wet head, or a shriek as something small dashes over your shoe. Not a relationship, not part of the usual narrative. Something other and apart. What is funny about the pigeons, and what makes them different though, is that they do get in my photographs. If you look through the projects on this site you’ll notice them creeping into a couple. I knew, of course, that they were there and I haven’t had any problem accepting them. They are as much a part of the experience as the rest of the referent. This is where we acknowledge their special status amongst ‘wild’ animals as almost equals. Not shy, not hidden. The streets heave with people AND pigeons. We walk, they walk, we have lunch, they share it. They cross boundaries that other creatures don’t. We don’t think they are cute, like squirrels. We don’t get freaked out by them as we do with rats. We might not like them but we definitely accept that they share our environment and when their concentration is lower than say Trafalgar Square we don’t even think about trying to get rid of them. It would be odd to think of chasing pigeons out of my images, in fact it is odd to think about pigeons at all, but after reading this book I think I will thinking about them for a while. When I read in this book about the birds being released I immediately thought back to a photograph I had taken near Marcus Garvey Park, a mass of birds circling overhead. I’d taken the photograph just because it was a sight to see them swooping all together in that clear blue sky. They looked like they were having a good time, really enjoying themselves. Now I am wondering whether they’d been let out from a nearby loft, maybe one in the Bronx that I’ve just read about in this book. Cambridge, 27-29 East 124th Street opposite the North end of Marcus Garvey Park. Have you noticed any of the pigeons in my projects? What do you think – should they be there? Have you got any in your photographs? Why not post one here or on the facebook page? Staying on the subject of photographs I recently saw the student show at the International Center of Photography and guess what was featured? Yes! Pigeons. The metal cages so perfectly accentuated the iridescent colours of these birds that I became quite enthralled by the images, despite the sorry state of the birds. Maybe some of these birds were ones that had been ‘lost’ during the races I read about in The Global Pigeon. Jerolmack, Colin, 2013, The Global Pigeon, University of Chicago Press, Chicago. I love Bruce Davidson’s photograph of Lola and pigeons in Central Park http://www.vervegallery.com/?p=search&q=bruce+davidson&r=10&o=10&s=14 There’s something about seeing all those wings fluttering. It’s a ‘murmuration’ for starlings – don’t know whether there’s a noun for pigeons. We have foxes around here. I know many people don’t like them but I love to see them and admire the way they’ve continued to manage to live alongside us and still survive. Thanks for sharing your photos, btw pigeons are called a kit when they fly in a group, who knew! Your Venice photos illustrate nicely the points Jerolmack makes in his book about the different ways we interact with pigeons. With sitting forbidden, except for those paying for their coffee, feeding the pigeons gives people something to do except stand around and ‘feeding the birds enabled an interactive engagement with the piazza and was a way for visitors to personally experience and consecrate the square as a distinct place’ (Jerolmack, 2013). Comparing your images with the Bruce Davidson image we see the different relationship of focused feeding of the pigeons. A mutually agreeable and constructed interaction and a ‘a form of sidewalk sociability’ (Jerolmack, 2013) LOL I learnt a lot from this book! I’ve never seen foxes here, but apparently skunks are on the rise! Yikes! This is awesome! I love that you stumbled upon my book at the library, and that it sparked you to think about it in relation to your own–completely different–interests. Really neat. And by the way, that picture from Marcus Garvey is most certainly of domesticated pigeons that someone is directing. Domesticated pigeons for sure. 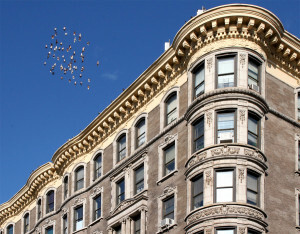 As a child I remember the flocks of pigeons flying around the roof of buildings. These flocks were owned by people (some of them friends of mine) and kept in pigeon coops on the roof itself. It was a sort of hobby and pretty fascinating finding out about the different “baldies”, “tumblers” (names of certain pigeon characteristics), and the culture of pigeon coop owners. It was something that was done by inner city kids, along with kite flying from the roofs as well. Growing up in Spanish Harlem in the 50s, you were always in the midst of these cultural phenomenon that we all took for granted but that was quite unique for New York City. Amongst the galahs, rainbow lorikeets and parakeets that I put food out for every morning at home I also have a handful of pigeons that come to ‘tuck in’ . I’ve photographed all the other birds because they are so beautiful and colourful….but I’ve never photographed the pigeons. As soon as they get here I’m pulling out the camera!